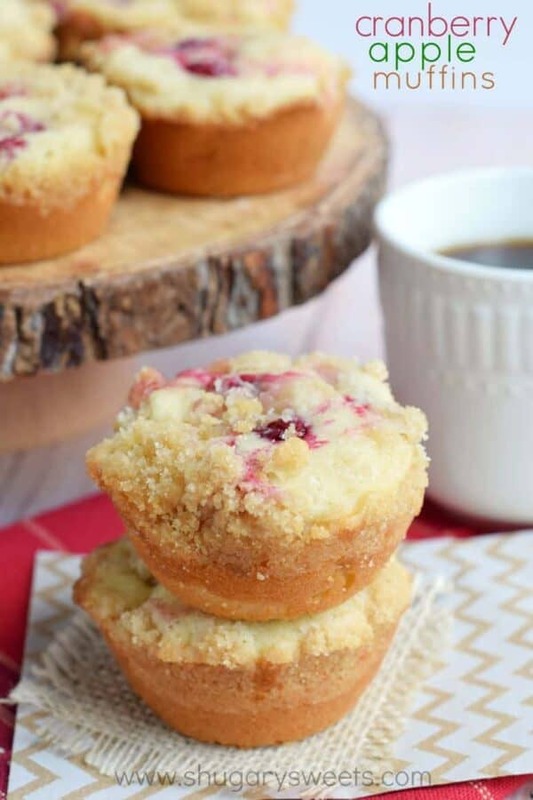 Perfectly moist and flavorful Cranberry Apple Muffins. 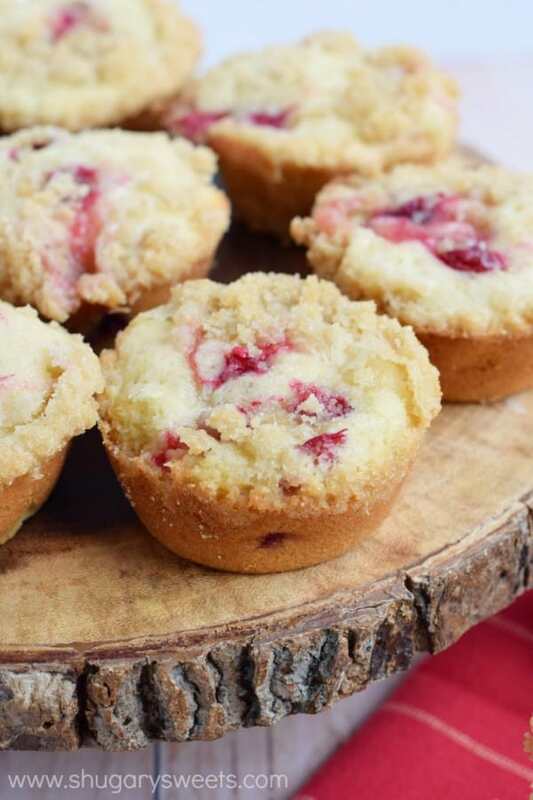 Topped with a buttery streusel, these are great for breakfast, or store them in the freezer for later!! Today is my birthday. I turned 42. Is that old? I don’t even know anymore. When I was 20, my mom turned 40 and I thought she was over the hill (sorry mom!). But of course, once I hit 40, I didn’t think it was that old. I guess it’s all relative right? Here are a few things I’ve learned in my wise years of living on this earth. Kids grow up fast. While it seems like 18 years is a LONG time to raise a child, and when they are 2 yrs old throwing tantrums, I know I personally looked forward to the “next phase.” But, as a wise person, ENJOY the phase they are in. Seriously. Because 18 years goes fast. I still feel young at heart…even though my wrinkles tell another story. Exercise. I’ve been blessed with some good genes in my 20’s and 30’s that left me being able to eat what I want with minimal exercise. But the day I turned 40, my metabolism said “no more free rides.” Since I love eating indulgent food, I have had to counter this with lots of exercise. I spent about a year in denial, hoping this was some cosmic mistake, not wanting to go to a gym. But, now I’m back on the wagon, so to speak. Hitting the gym with weights a couple times of week. This is a must for me, and I wish I had been doing this regularly, but it’s never too late to start!! Food. Oh how I love food. And if you read my blog, or browse my recipes, you may see a lot of sweets. But it’s not the sweets that tempts me (well, unless it’s a plate of rice krispie treats). It’s a bag of chips. Doritos? Game over. BBQ chips? Pass the bag over and don’t think I’m gonna share. Thankfully, since I have begun exercising again, I’m able to continue indulging occasionally in those salty “treats.” Everything in moderation, right? Live life in the moment. Don’t put off what you could be enjoying today! This is one I struggle with often. As a working from home mom, especially in the summer, life is about balance. I put my family first. And thankfully, since I am my own boss, nobody yells at me if I only post twice a week instead of three times. Or if I completely skip getting on the computer one day because I’ve sat at the pool with my kids and read a book all day. I don’t ever want to regret not being present for my kids! Coffee. Another must in my life! A good cup of coffee in the morning, sitting outside on my patio, watching the birds in my yard. It’s why I appear to be a senior citizen! Part of enjoying that cup of coffee is also enjoying a sweet treat with my breakfast. I know many people love to start their day with a healthy bowl of oatmeal. But that’s not me. I get my sweet tooth craving done in the morning. Then I have all day to fit in that exercise and healthy eating to compensate! Today’s muffins are amazing. The base is a sweet, moist muffin with a great crumb and texture. I added in some fresh diced Crunch Pak apples and some frozen cranberries. 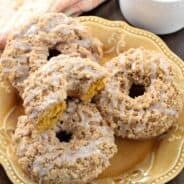 The topping is a buttery streusel that adds a delicious crunch with every bite! For today’s recipe, Crunch Pak sent me some of their new sliced apples (in a bag) that were already peeled. SCORE!! 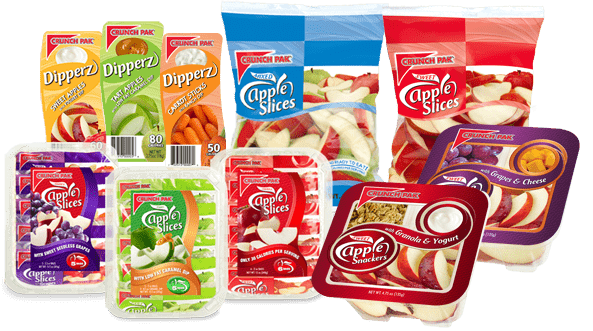 Normally I would use the Crunch Pak mixed Apple Slices (in the blue bag). I find these at Target! The recipe makes 24 muffins. Perfect for freezing or sharing with friends and family! ENJOY! Preheat oven to 350 degrees. Spray muffin tin with baking spray. Set aside. In a large mixing bowl, beat butter, eggs, vanilla extract, almond extract and sugar until well blended. Add in flour, baking powder, baking soda, and salt. While beating this in, slowly add buttermilk. Once added, beat for 2-3 minutes, until batter is fluffy. 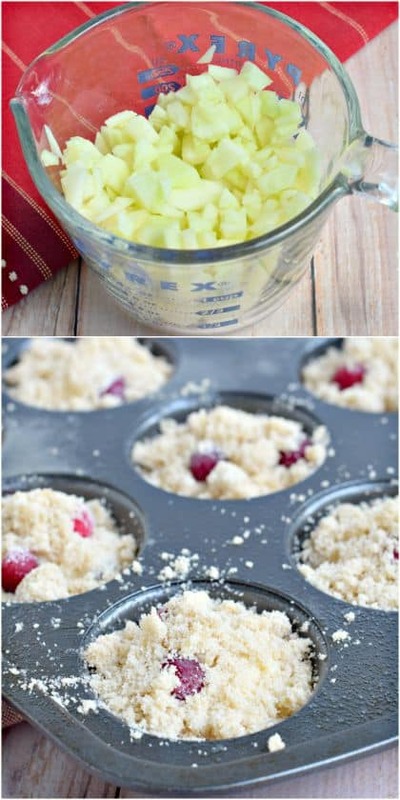 Fold in cranberries and diced apples. Spoon muffin batter into muffin tins, about 2/3 full. In a small bowl, combined streusel ingredients with hands. The mixture should become a crumbly topping. Sprinkle generously over muffins, using a knife to slightly tap or swirl some of the mixture into the muffin batter. Bake muffins for 20-22 minutes, until toothpick in center comes out clean. Remove from oven and cool in pans 5 minutes. Remove from pans and cool on wire rack. Store in airtight container (or cake saver) for several days. Or freeze in ziploc until ready to enjoy. 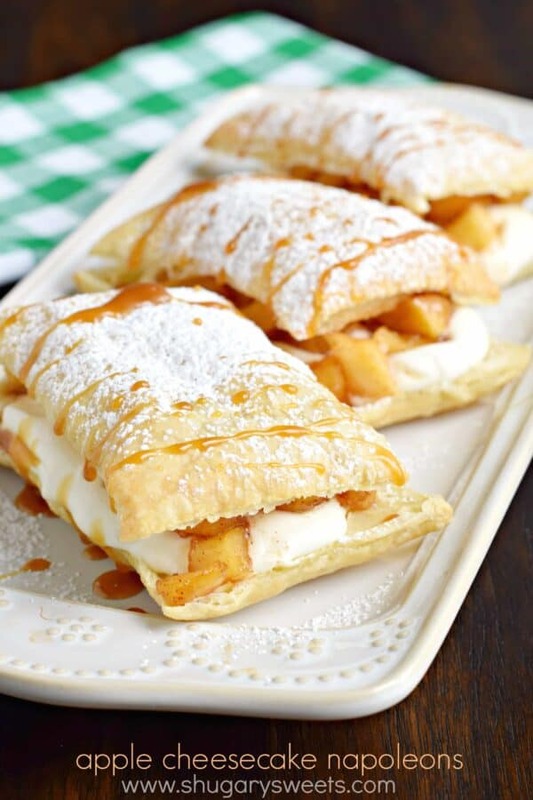 Apple Cheesecake Napoleons: easy dessert idea that is sure to impress family and friends!! A great alternative to making a pie! 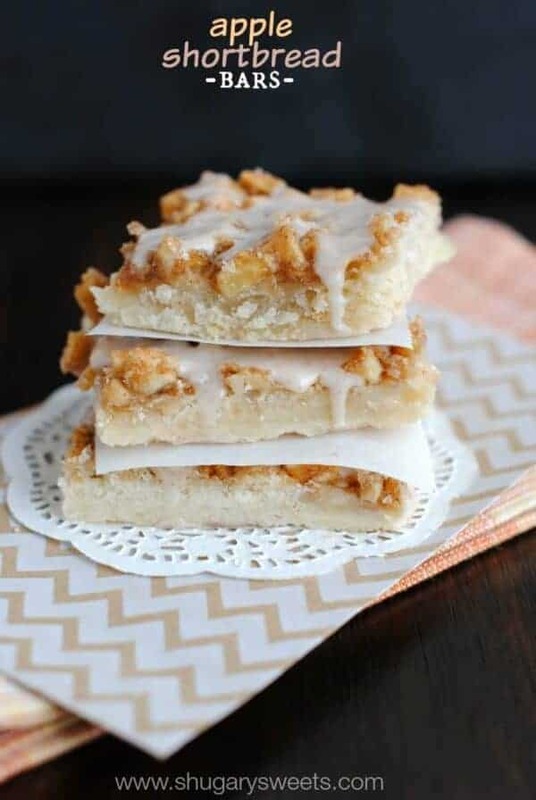 Apple Shortbread Bars: hands down these delicious cookie bars are one of my favorite treats!! 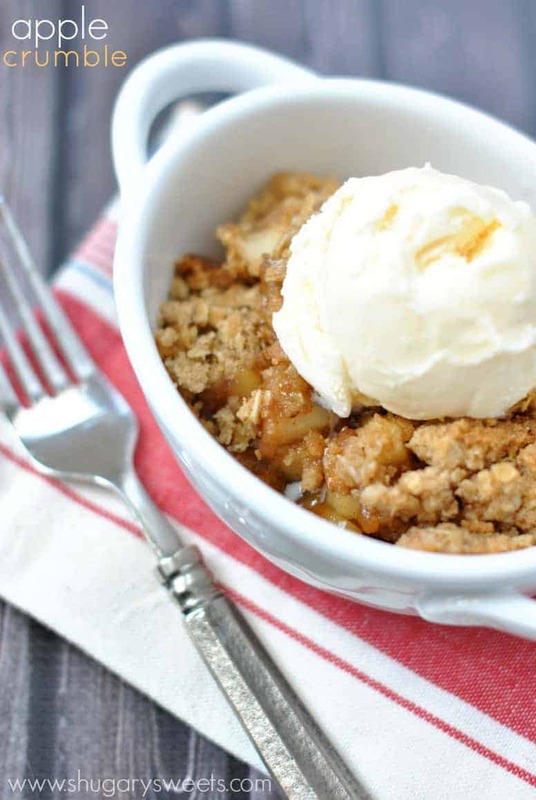 Apple Crumble: a classic dessert topped with ice cream. It doesn’t get much better than this!! Apple Blondies: looking for something different, yet amazing? 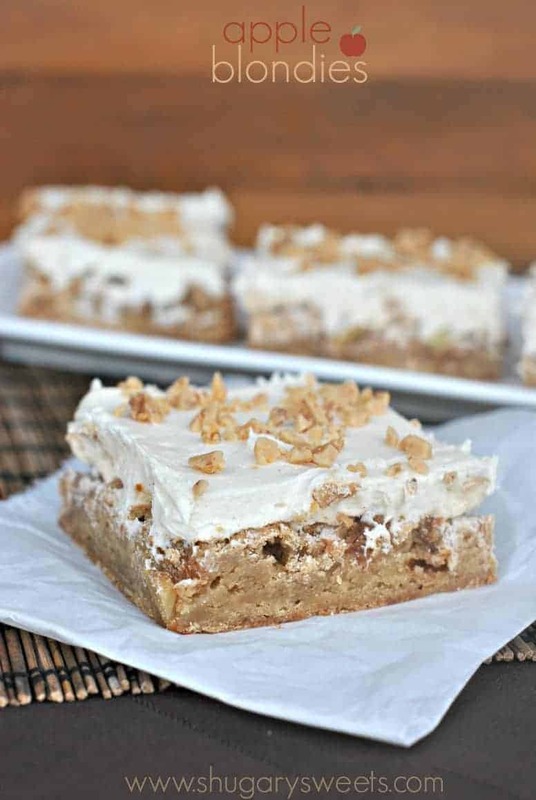 These blondies are chewy, sweet, and topped with frosting. OMG YUM!! Excellent life advice, Aimee. Besides, 40 is the new 30, so no worries. If you sleep and moisturize and exercise and eat chocolate, it’s all good! 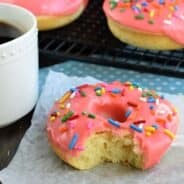 These will go perfectly with your coffee, too! Apples and cranberries are the perfect combination. Can’t wait to make these with the apples we grow here on our farm. These muffins look fabulous! I wish I had some to go with my coffee right now! Haha. YES. I remember thinking 30 sounded old. Now I’m 45 and it doesn’t seem like it. Well, maybe some days. Lol. I agree with all of your life lessons. And what I’ve learned is that I need these muffins in my life! Love your life lessons/tips – and these muffins! Awesome Aimee, Happy Birthday!! These muffins are perfect! Actually, oatmeal isn’t really any healthier than muffins and other baked so you might as well go for the yummy treats! And now I’m on the hunt for those apples with low fat caramel! YESSSSSS. Also peeled apples in a bag = genius. Oh, the days of laying out in the sun with my hair drenched in sun in! Some things you just have to do and learn from your mistakes…glad I learned my lesson quick from that crazy sun in product. Although I still enjoy laying out in the sun and soaking in the warmth. My wrinkles don’t love it as much though! I love this fun post of life tips! And these muffins looks so good! 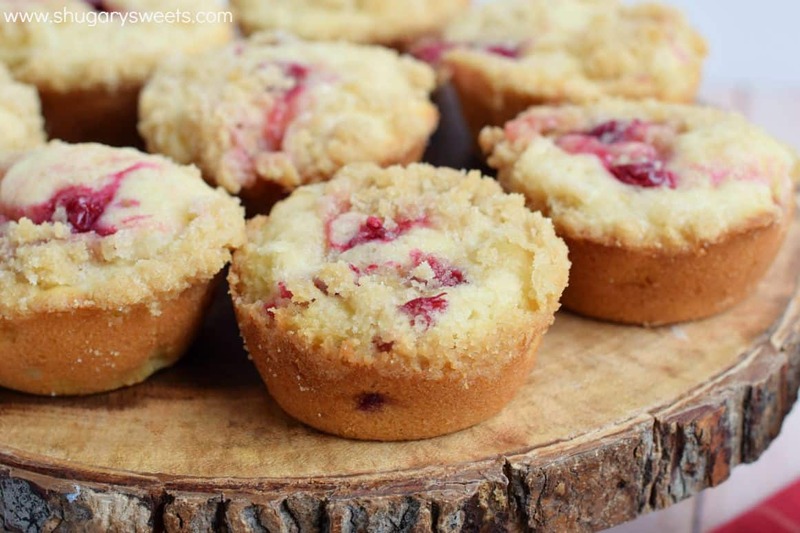 Love the cranberries and streusel paired with apple goodness! These look fantastic! They have me in the mood for fall…which needs to get here ASAP! Hi Amy, Happy Birthday! I love your blog! 42 is young. This 55 year old senior citizen can attest to that. LOL. I love to bird watch, too. Your blog today made me smile and laugh. Praying that all goes well with your son in this new phase of his life. Have a great week! Awww thank you so much Lisa!! And thank you for the prayers for my son 🙂 Have a great day!! Oh, wise one, I love your truths. So true! Preach it sista. And I really love these muffins! Aimee!! First off, HAPPY BIRTHDAY!!! and no, you know what. . age is a state of mind. I am also in my early 40s and still feel like I’m in the late 20s .. and am probably in the best shape ever . . celebrate 42 and work it! 🙂 and YES to sunscreen and moisturizer daily!!! OH MY GAWD, if only I knew then what I know now, I would not have spent so much time in the sun when I was younger! OK, I LOVE these muffins!!! I love the cranberry + apple combo!!! they look delicious! And I can’t wait to hang out with you and Jocelyn and the others in Kohler, WI in October. . you’re going right?! Happy birthday! These are a perfect way to celebrate! Aww you’re too sweet Sues!! You are a wise woman, my friend! 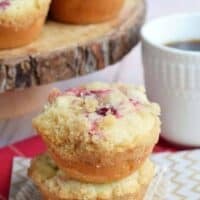 Love your tips and LOVE these muffins even more! I learn from the best!! I just returned from my 3 mile walk because you are right we need to take care of our bodies. I love these muffins. I have made ALL of your biscotti recipes and each one is better than the last. I have not been receiving my subscribed e-mails lately, but when I try to re-subscribe the message says I already am registered. Is there a problem? I am way older than 40 and I am still waiting for the wisdom phase! As a senior, I look back, as you have, and see the mistakes made. Life is a challenge. I will also pray for your son in the armed forces. Keep bird watching, I know I enjoy it too! Instead of muffins can this be baked in a 9×13 baking dish? I tried this recipe in a loaf pan and it worked out fine. I baked it for 55 minutes then I put a piece of foil on top to keep the streusel from getting too dark and baked for another 15-20 minutes. I think this would work fine in a cake pan as well. It seems more of a coffee cake to me. 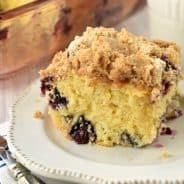 My one suggestion would be to fill the pans about 1/3 full, add a layer of streusel, then add more batter to fill 2/3 full and top with the rest of the streusel. I tried running a knife into it to pull it in from the top but that didn’t really work. After cooling the loaf, a lot of the streusel topping pulled away from the cake a fell off. I also had some of the topping left over. Thanks so much for the recipe.